Lie down, close your eyes, relax, and take calm, comfortable breaths. As you recite the mantra quietly over and over in your mind, move your awareness gradually from the head to the heart. This is just one of many techniques that can help you rise to a finer state... and for me it's by far the best of all. (MM) And here are some additional techniques. ITC depends on a clear channel to the other side, which allows the spirit team to communicate with us and then to direct our earthside team further. A clear channel is a field of consciousness… a state of mind-body consciousness (or contact field) that is open, calm, loving, honest, trusting, and connected with finer self. Those finer qualities of human nature flow through society and through an ITC group like a gentle stream in the woods. The contact field needs to be clear of fear, doubt, deception, anxiety, judgment, and other harsh motivations that lurk in the shadows like predators and scavengers. The more each member can enjoy the finer stream of consciousness, the more the channel will be light and open and clear. With that in mind, forming an ITC group is like being stranded on a forest island together with a broken radio. Until we can fix the radio, nothing else really matters beyond basic survival. Fixing the radio means getting everyone to agree on the group’s mission and afterlife model, and on the importance of placing principles above personalities… spiritual connections above egos. ITC is an adventure in which we enjoy the gentle stream of finer consciousness while avoiding the dangers lurking in the shadows. So, this inner-work section of the website, with its private workspace for each member, helps each member to resonate with the ITC group by fostering a conscious connection to finer spirit. Routine meditation and prayer. Meditating and praying on a daily or regular basis can forge a connection between our conscious mind and finer spirit. Heart meditation in particular. Simply moving our awareness from the head to the heart relaxes us into a finer state of consciousness. Mystics call the heart “the seat of the soul,” making this an especially effective technique for resonance among humans and with finer spirit. Brain synchronization. Delivering pulsed stereo tones (binaural beats) through the ears to the brain can also relax us into finer states. Dream journaling and lucid dream work. Dreaming is a time when our conscious mind closes down to the material world and our spiritual mind becomes active in the spirit worlds. Paying attention to our dreams can help to bridge the gap between these two inner parts of our self. If our dreams are mostly peaceful and happy, we're probably suited to do our part in an ITC bridge with a competent, respectful spirit group. If we often awaken from troubled dreams in which fear or anger or aggression is prevalent within us or among those spirit-people around us in our dreams, then our presence in the ITC group will likely disturb the contact field and attract troubled spirits into the bridge... in which case we might choose to do more inner work using the tools and techniques in this list until our dreams "lighten up." 12-Step process. Adapted for ITC research, the 12 steps could be the most comprehensive tool for acknowledging our carnal shortcomings, acknowledging the presence of finer spirit, forging a conscious connection to finer spirit, evaluating our shortcomings that block the connection, turning our shortcomings over to a higher power, sustaining resonance with the ITC group, and committing to serve the group. The 12-step process, then, is well suited to be a cornerstone of an ITC group’s private website. Each member’s private workspace would center around the 12-Step process with its comprehensive, measurable approach to self-attunement, while encouraging the use of other tools and techniques as well, to sustain resonance within the group. New members (provisionals) would go through the 12 steps and learn each of the other tools and techniques before becoming operatives. Members could use the tools that appeal to them most (meditation, dream work, and so on), and the 12 steps would be called into play when needed; for example, when a member faces troubles in life that seem insurmountable, or when conflicts between members spiral out of control. Again, the 12 steps can restore order when our lives and relationships become unmanageable. Exactly how and when to use the tools for refinement and self-evaluation, and under what group guidelines, are factors that might have to develop as an ITC group evolves and moves through its growing pains. Resonance does not come easily to us humans, and we have to figure out what works the best. So, to help keep everyone on the same page and of “one mind,” each member has a basic workspace where they 1) work on refinement and self-evaluation and 2) assimilate the group mission and afterlife model. The basic workspace might include a work history checklist, a set of personal records for each member, links to helpful resources, privacy options, the member’s personal profile, and access to the group’s membership list with all of the members’ profiles. A checklist like this could include a comments box to the right of each refinement tool where members can keep track of their workspace activity (results, experiences…). Each time they use one of the refinement tools, they checkmark the appropriate box and add comments about the experience. The comments would be logged, along with time and date, into the private records of the members. New members spend at least three months learning the refinement tools and techniques and assimilating the group’s mission and afterlife model. As they progress through the work history checklist, they check the appropriate item and write detailed comments about their experiences. The checkmarks and comments remain in the work history checklist until they are all complete. Once they have checked all of the items over a period of at least three months, they can choose to become operatives. At that point, all of the results of their work--all of their comments—are recorded into their private records, and the checklist is then cleared for their future use as operatives. Established members (operatives, facilitators, and offline provisionals) use the checklist each time they visit their basic workspace. For example, if they have an especially meaningful meditation or dream, or if they need to work some of the steps in the 12-step process, they check the appropriate box and write a report about their experience, which is added to their private records. After each visit, and after the results are recorded, their checklist is then cleared and ready for the next visit. Unless a member chooses otherwise, his or her personal records remain private and can be seen by no other members of the group. In this matter an ITC group is unique in that we acknowledge that nothing is really kept secret from finer spirit... that our "private" records might be hidden from each other but are well known by our spirit friends, the invisible colleagues at the other end of the ITC bridge. Our inner motivations and hidden agendas have a strong influence on the spirits who choose to work with us, and the conscious blocks that we carnal humans build around our inner motivations are transparent to finer spirit. They "see into our soul," as we humans like to say. That's why these personal private records can be an important part of an ITC group: Finer spirit can see how well we get to know ourselves as we do the inner work, and that helps them to determine in what capacity and to what extent they can help to establish and to sustain an ITC bridge between our group and the spirit group that coalesces around our efforts. New members, after completing the work history checklist, could be asked to fill out another comments box with their first impressions. They could give their opinions of the various tools and techniques and report on their experiences while using them. Those comments are added to their personal profile and can be seen by other members of the ITC group. The personal workspace could include links to the group’s mission and afterlife model, and to lots of good self-refinement tools and techniques, such as the following…. Open-Select (accessibility only to other, specified members). For example, a new member might want to allow temporary access to a facilitator for review and advice. Also, the greater degree of self-honesty a member achieves through inner work, the less need there will be for privacy. A committed member who has become genuinely self-honest might eventually choose the "Open" option, sharing his or her inner work results with any ITC group members who are interested in seeing them. ​first impressions while signing up…. Should the profile include a picture? Probably not. While mugshots can give a familiar sense of the person, they can also give a false sense of character (for better or worse), and we humans sometimes overemphasize appearances. There might be a page of pictures somewhere on the private site that show members in candid group settings, but probably not mugshots in the member profiles. The personal workspace could have one-click access to a list of all the members in the ITC group, showing each member’s name and membership status (provisional, operative, or facilitator). When the list is displayed, you can click on a name on the list to see that member’s personal profile. The personal workspace should be welcoming to newcomers, not intimidating, since it’s the only active area on the private site that they, as provisional members, can access. No access to the chat rooms, experimental pages, meeting schedules, and other working areas in the private site until the member becomes an operative or facilitator. Review the group values and find them acceptable (or not). If so, then create a personal profile. 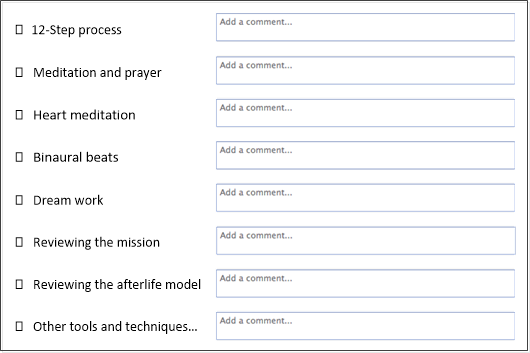 Before creating a personal profile, the new member goes through the work history checklist as a way of learning the group’s mission and afterlife model and 12-step process and other refinement tools. All of the comments made in the work history checklist would go into the private records of each member. Then the member would write an overall report in another, separate comment box called “First impressions,” and those comments would become a part of the member's personal profile that other members can see. So, this is a time during which a new member (a provisional) can decide whether to join this ITC group… or whether to search for another ITC group that seems more compatible… or whether to avoid all ITC groups. A new member who finds the group values generally agreeable can become part of the group. A profile for the new member is created when he or she completes the work history checklist. Established members are encouraged to continue using their private workspace. The more they use it, the finer the resonance of the group. Refinement work and self-evaluation are especially helpful in times of trouble. Turn our life over to finer spirit (step 3). Meditate and pray and use other refinement tools and techniques, whether for a few seconds or a few hours (step 11). Take a brief inventory around bedtime, looking back over the day at situations when we were wrong, and promptly admitting it (step 10). Fostering this attitude can become an effortless daily routine for all members. They could use the work history checklist every time they visit their workspace, whether once a day or several times a week. When problems arise for a member, whether the problems are related to the group or not, the member can go through the self-evaluation and housekeeping steps to determine what part he or she played in the problems. Face our fears, desires, judgments, doubts, and other troubled thoughts while taking a moral inventory of ourselves (step 4). Admit to ourselves, to finer spirit, and to at least one other member of the group the nature of our failings (step 5). Reach a point, through inner work, where we’re ready to have finer spirit remove our shortcomings (step 6). Humbly ask finer spirit to remove those shortcomings (step 7). If problems persist?... if a member is going through a stressful time, maybe a family crisis or problems at work, he or she can choose a change to provisional status so that the stress doesn’t boil over into the ITC group. The member can spend more time and effort now with the refinement tools to get through the problems. Then, when the situation resolves, the member can return to operative or facilitator status. Listener is a temporary role assumed by a facilitator to help another member get through steps 4 and 5. A listener is needed for step 5 either when a new member is in the initiation phase, or when an established member is going through some difficulties and needs to revisit those steps. A member working on step 4 will explore any aspects of himself or herself that seem to be causing problems in life or in the group. Then, working on step 5, the member will select at least one other member to be a listener… someone with whom the member will explain or discuss those troubling aspects of self. Then, once he or she feels ready (step 6), the member solicits the help of finer spirit to remove those defects of character (step 7). someone who can keep a secret, not sharing the information with anyone else. The listener’s role is akin to the role of a psychologist or therapist or religious father confessor, but without the diagnoses and Hail Marys. Mostly listeners just do reflective listening. They encourage the member to get it off his or her chest, and they reflect back with empathy. They don’t offer any advice, they don’t ask questions, and they don’t try to lead the conversation in other directions. Reflective listening is a simple, basic skill that facilitators would learn as part of their group management training. So, the records of each member’s personal workspace activity would be stored on the site, and they would track in detail the work that’s been done around the 12 steps and other tools and techniques toward refinement, initiation, and self-evaluation. The records would remain private unless the member chooses to share them. Conflicts are inevitable in human relationships. This inner-work section of the website will minimize them, but probably not eliminate them altogether. As members interact on the private website in chat rooms and on ITC projects, words can be misspoken or misinterpreted, causing hurt feelings. These situations should be handled quickly by the members involved, with heart-felt apologies and forgiveness. If the problems persist, the members can work through them using the 12 steps in their private workspaces, as each member explores his or her own role in the conflict. If problems persist even after individual efforts to resolve them, then facilitators can step in to reclassify those members as provisionals during a “cooling-off” period in order to sustain resonance in the ITC group. The members in conflict are then isolated from most of the private site, except for their personal workspace, and they can spend more time and effort determining their part in the conflict and deciding whether or not they really want to be part of this ITC group. So again, the “broken radio” on Earth needs to be fixed and well-tuned before ITC can work… and that involves inner work by all members of an ITC group… getting everyone to resonate to the same moral frequency… since to be human is to have shortcomings that cause our inner signals to stray out of sync from time to time. We, The Seven of the Rainbow People, have decided to help and support the way chosen by you in INIT. It is the way of morals, which means to understand, to acknowledge, to devise, and to act…. To use the tools and techniques provided by the group in order to sustain resonance.